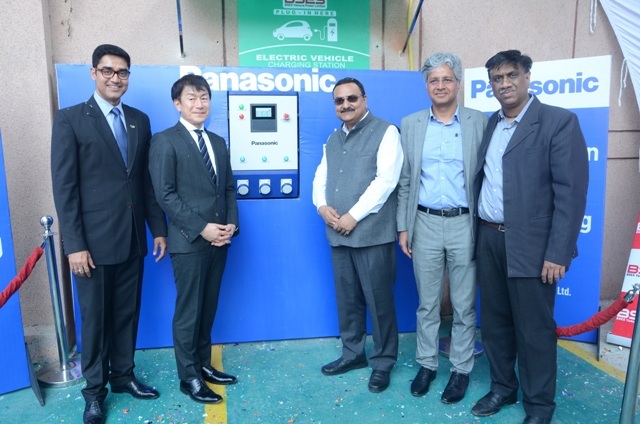 Panasonic has announced its collaboration with BSES Yamuna Power to set up electric vehicle charging station at their New Delhi head office. The company has developed the charging station in India at their in-house R&D centre. Built in compliance with the Bharat EV AC 001 standards released by DHI, Panasonic’s smart AC charging station comes equipped with 10KW power and can charge up to three electric vehicles simultaneously. The newly launched charging station also reduces the charge time significantly for lithium ion battery powered electric vehicles, almost 3 times faster than the conventional Valve Regulated Lead Acid (VRLA) Batteries. With this association, Panasonic aims at strengthening the partnership with one of the progressive DISCOMS and scale it up in the future. The pilot facility inaugurated is state-of-the-art and comes with key advantages such as enforcing the authorised charging, automated revenue collection understanding of the charging behaviour and pattern, real time charging data, app based control and automated payment mechanism, etc, apart from being the most reliable and rugged product in the market.